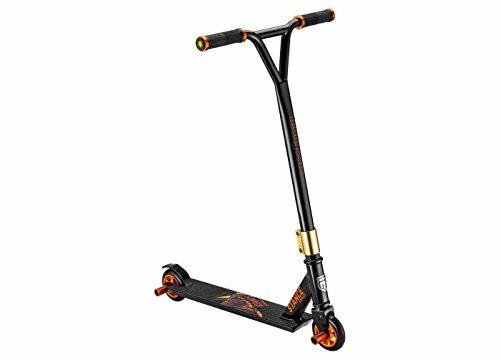 Are Mongoose stunt scooters any good? We are going to answer that question and provide a surplus of information in this article. Mongoose was founded in 1974 in a southern California garage, through the years Mongoose has become a giant in the bicycle space. There product offering consist of Bmx/Freestyle bikes meant for tricks in the street, parks and dirt jumps. Urban bicycle riders wanting to do their part to preserve the OZone layer or just get exercise as they commute can also rely on Mongoose for a solid bike at an affordable price. Lastly extreme mountain bike riders can also opt for a Mongoose brand MTN bike for downhill runs and trail riding. In the last year or so Mongoose has shifted gears from Bikes to Stunt Scooters. With experience in the bikes arena it makes sense for them to experiment in the growing scooters market. Below you’ll see Mongoose’s most popular offering… a scooter paying homage to the popular 1980’s BMX scooters. 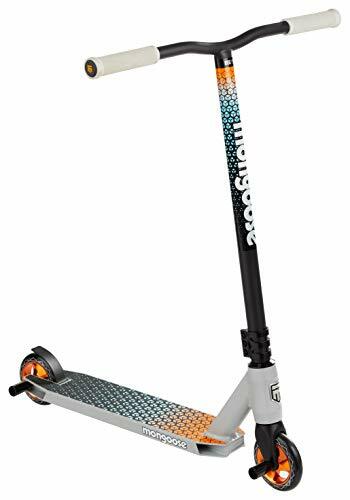 Where to buy Mongoose Stunt Scooters? Due to Mongoose not putting priority on their scooter business segment often times the Stance and Stance Pro Elite are not available online. 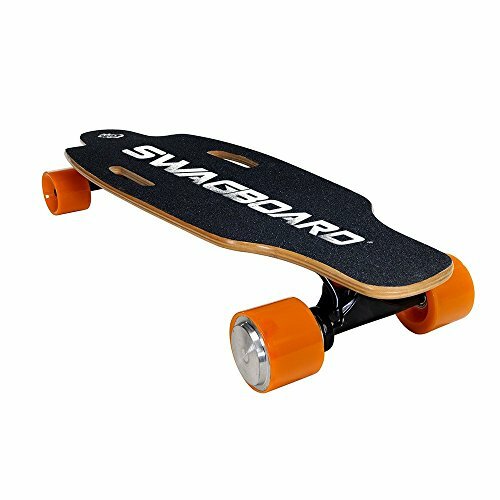 So we recommend the best available Mongoose scooters and excellent alternatives. 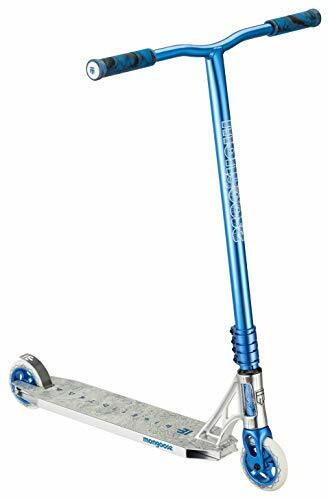 Getting back to the new stunt scooter segment…their initial shot at pro stunt scooters Mongoose released the Stance Stunt Scooter. 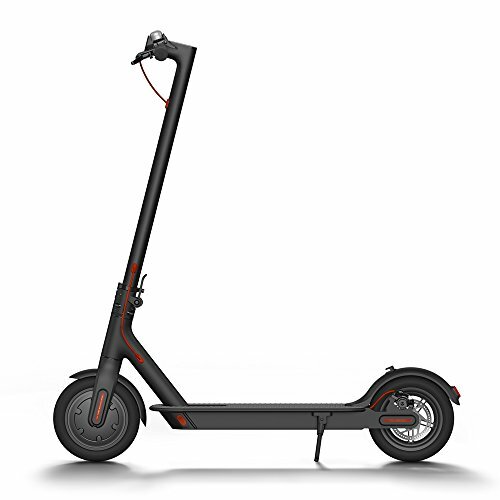 The Stance scooter comes in three different trims designed to meet the needs of three different riders. Entry level, intermediate and advanced intermediate. Let’s take a closer look at the Mongoose Stance scooter in the different levels and see what they are all about. Lightweight alloy deck with extended standing area for pro-style scooter performance. Full-coverage MaxGrip on the alloy deck and brake combine with 110 mm high impact alloy wheels and durable ABEC-9 bearings to provide smooth non-slip riding. One-piece welded alloy T-bar handlebar with bike-style grips provide the perfect combination of durability and comfort. Quadruple anodized CNC clamp collar with sealed internal threadless headset, and CNC alloy fork for precise, crisp steering wherever you go. The Stance stunt scooter by Mongoose is a great beginners scooter. If you are a fan of Mongoose products or particularly like the color scheme of this scooter go for it. However the Fuzion X-3 or X-5 would probably be better buys. 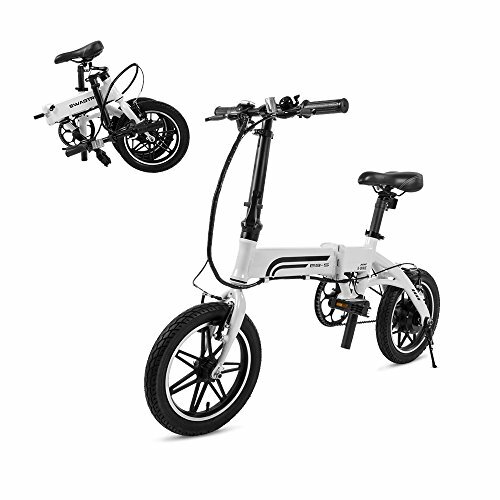 The first version of the Stance scooter is equipped with an alloy deck, 100mm wheels, 1-piece welded Y-bar and an anodized triple clamp. This set up of components will be sufficient for any younger rider looking to start riding scooters aggressively. Mongoose rates the scooter capable of supporting riders up to 220lbs. 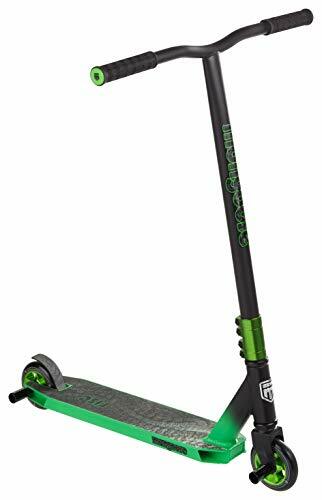 Also the recommended age for riding the Stance is ages 8+ , however from our experience we’ve seen younger kids more around the age of 6 being suitable for this product. What people are saying about the Stance Freestyle Scooter? Melody C. a mother with two sons ages 8 and 12 loved the Stance Freestyle, she told us that her boys loved the scooter. Melody liked the bright orange color of the deck and she also love that the scooter was very easy to assemble. Other things customers love about this scooter is that it is very affordable and its overall styling. 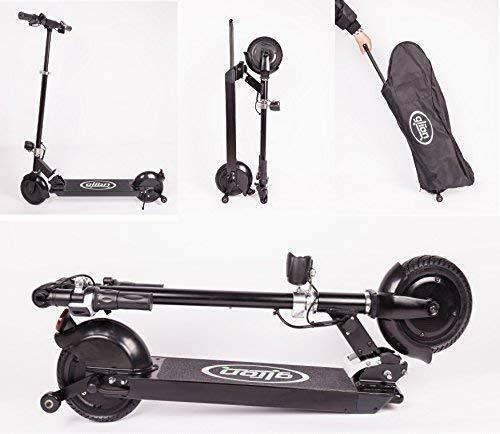 If you are comparing this scooter to a true pro scooter you might be disappointed but for a family buying it’s first stunt style scooter you will be pleasantly surprised at the build versus a traditional razor A2 style scooter. Full-coverage MaxGrip on the alloy deck and steel brake. 100 mm high impact plastic wheels and durable ABEC-7 bearings to provide smooth non-slip riding. One-piece welded steel T-bar handlebar with bike-style grips provide the perfect combination of durability and comfort. Triple anodized clamp collar for precise, crisp steering wherever you go. 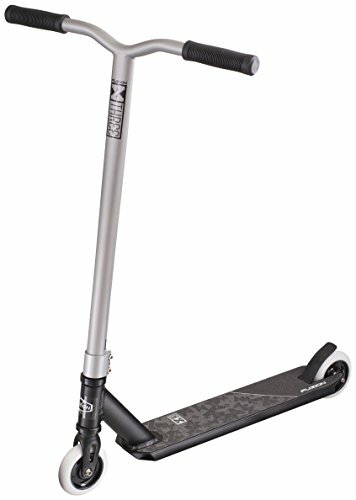 The “Pro” model is the Step up from the regular Stance Freestyle scooter, this model comes set up on the same foundation as its predecessor but with more bells and whistles so to speak. As a beginner your son or daughter isn’t going to be doing tricks like that but at least you know what their scooter is capable of. To make the package sweeter than the original Stance there are also other small details like upgraded grips and gold accented bar ends.The main upgrade to this scooter in our minds is the added alloy wheels a major bonus in lieu of the plastic cores in the previous model. Black also is used to trim the scooter making it look more sleek and streamlined. 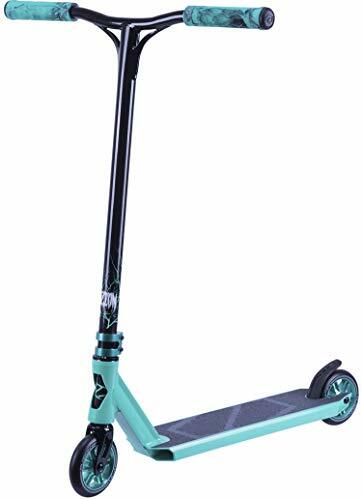 For relatively little extra money the Stance Freestyle Pro is a solid upgrade to the original but you might want to know how invested in scootering your son or daughter is going to be before shelling out the extra cash. Janet bought this scooter for her youngest son who wants to be like his older brother (a thirteen year old expert) she tells us that this scooter was a great buy. Her son is super excited and follows his brother around all day on his smaller stunt scooter. Lightweight alloy deck with extended standing area and front and rear alloy pegs for pro-style park performance. Full-coverage MaxGrip on the alloy deck and steel brake. 100 mm high impact alloy wheels and durable ABEC-7 bearings to provide smooth non-slip riding. Quadruple anodized clamp collar with threadless headset for precise, crisp steering wherever you go. The last offering from Mongoose is their higher end scooter titled the “Elite” version of the Stance scooter. What sets this model apart from all the others are the beautiful finishes. Elite means the highest of the high and this is the appropriate title for this scooter among the two other versions. Components are very similar to the “Pro” version but the finishing touches make this scooter look a lot cooler. An added quadruple clamp adds lock down to the bars, also the finite details like the fluted head-tube and purple accents on this model give it a much more elegant appearance. Full-coverage MaxGrip on the alloy deck and steel brake combine with 110 mm high impact alloy wheels and durable ABEC-7 bearings to provide smooth non-slip riding. Triple anodized CNC clamp collar, internal sealed threadless headset, and alloy fork for precise, crisp steering wherever you go. 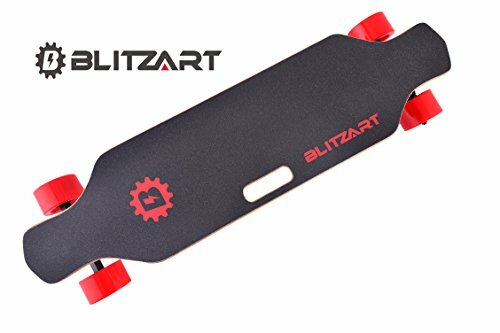 If you are unfamiliar with stunt scooters then you’ve come to the right place we are going to cover the different products in an unbiased manner. 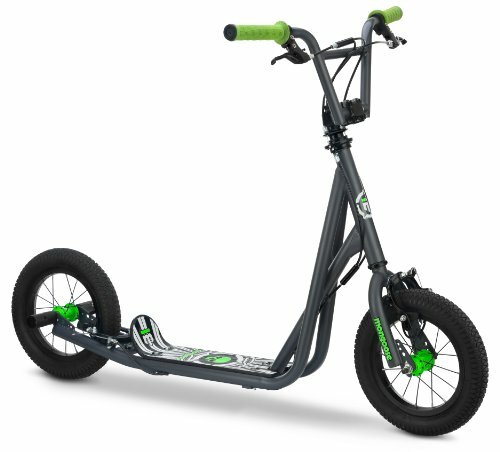 Since you are considering the Mongoose brand you are in the market for an inexpensive beginners scooter that is going to be durable and meeting the needs of your kid. From the entire Mongoose Stance line we would actually suggest the Stance Freestyle Stunt Scooter. Yep the lowest tier model! Why? Because the price point is the most attractive for what the scooter offers. Sure you don’t get pegs or a fluted head-tube but so what. Younger riders are just looking to get the hang of riding so why pay upwards of 35% more for features your kids aren’t like to put to use. Another option though is the Mongoose Expo stunt scooter, this BMX style scooter pays homage to the late 80’s and 90’s. Opting for the Mongoose Expo you’ll get 12″ inflated tires and the ability to take on dirt riding! For kids who aren’t into park riding the Expo is a great choice at a even greater price point! Mongoose is a pretty large brand in the United States, because of their huge success in bikes they have a massive network of stores including big box stores like Target and Walmart but also mom and pop bike shops too. 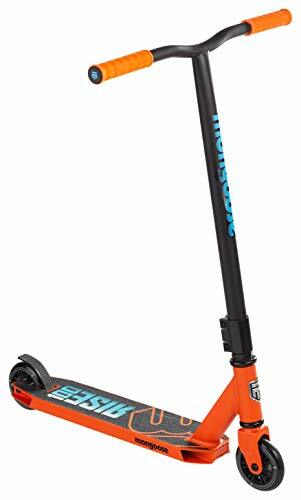 You can find these Mongoose stunt scooters in our scooter shop, on Amazon or at your local Target store. If you liked our review, please leave your feedback.